Voyo V2 would be yet another Intel Atom Z3735F based mini PC if it did not have a battery, and 96GB internal storage with 32GB eMMC flash, and a 64GB SSD. Most Atom mini PCs only comes with 32GB, and based on my experience, internal storage fills pretty quickly with Windows 10 or 8.1, especially if you intend to use the device as a desktop PC, and that even may be an issue with Linux distributions, albeit to a lesser extend. However, a lot of questions were asked about that “64GB SSD”, with even some readers suggesting it might be an internal SD card instead of SSD :). Today, we’re going to find out the truth as GearBest kindly sent me a sample for review. 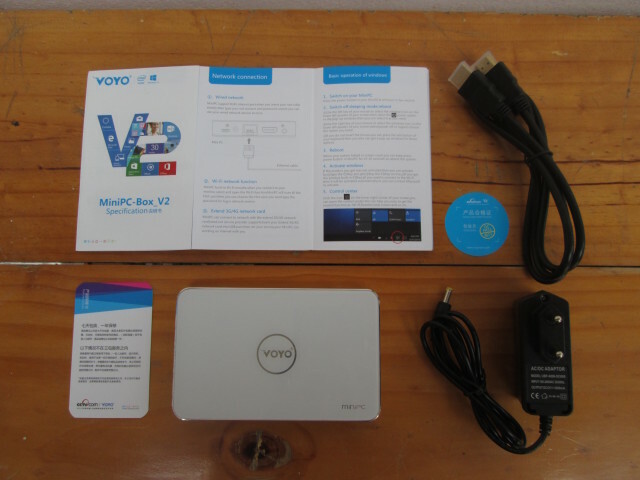 The mini PC package has a sticker in Chinese showing the brand (VOYO), model (MiniPC-Box_V2), and listing memory ans storage as “2GB+32GB eMMC+64GB SSD”. A EU to US adapter was also included in the DHL parcel. 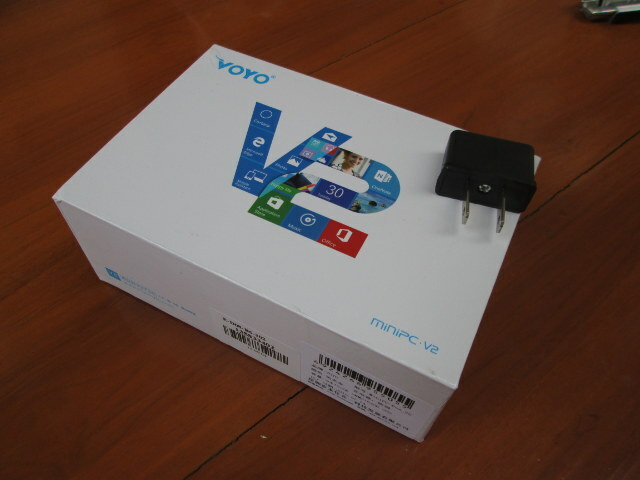 The box comes with a 5V/3A power adapter, an HDMI cable, “QC passed” and warranty cards, as well as a user’s manual in English and Chinese called “MiniPC-Box_V2 Specifications”. 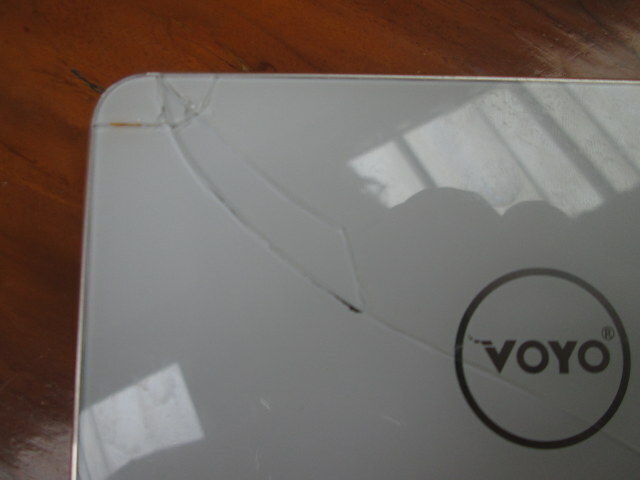 The case is made of metal on the bottom and side, with some of of plastic / glass on top. The power button is on the front, a USB port can be found on the rear panel, while most ports are on one side with a micro USB port, the power jack, an RJ45 Ethernet connector, HDMI output, and 3.5 mm audio jack. There are two clips holding the internal plastic case to the external metallic case. Let’s turn the box around, and we can see the battery, and the board with one white thermal pad. 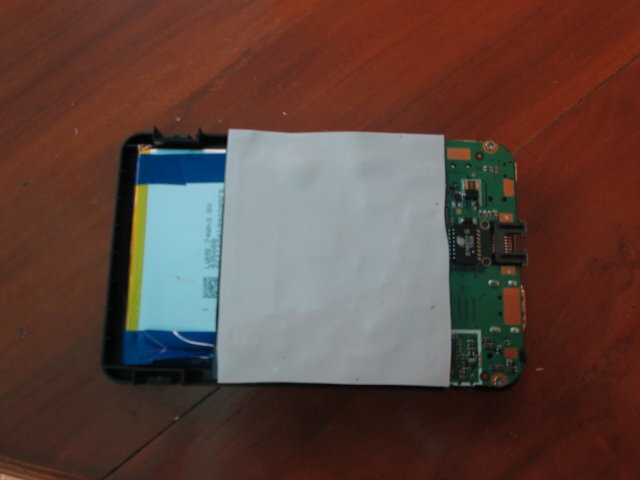 Under that thermal pad, there’s another black sticky layer to cover all major components. Beside Intel Atom Z3735F processor, the main components include four SKhynix H5TC4G63AFR DDR3L chips (2GB RAM), Biwin BWAMDIC21C32G (32GB eMMC flash), X-Powers AXP288 PMIC, GL830 USB to SATA bridge, and AP6212 WiFi and Bluetooth module. 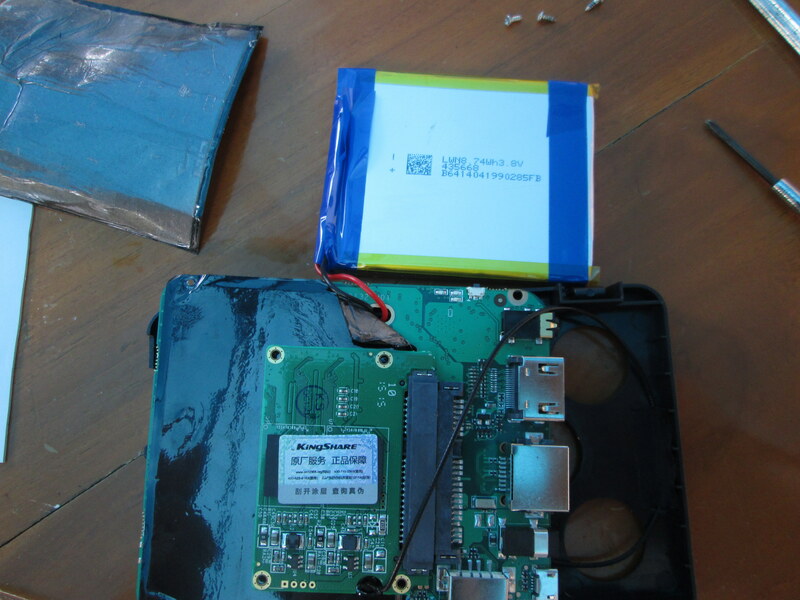 Let’s take out four more screws to remove the board, and have a closer look at the battery which according to its marking has a capacity of 74Wh @ 3.8V, or 20,000 mAh… That’s highly unlikely to say the least, and even Voyo lists the battery capacity to be 5,000 mAh. 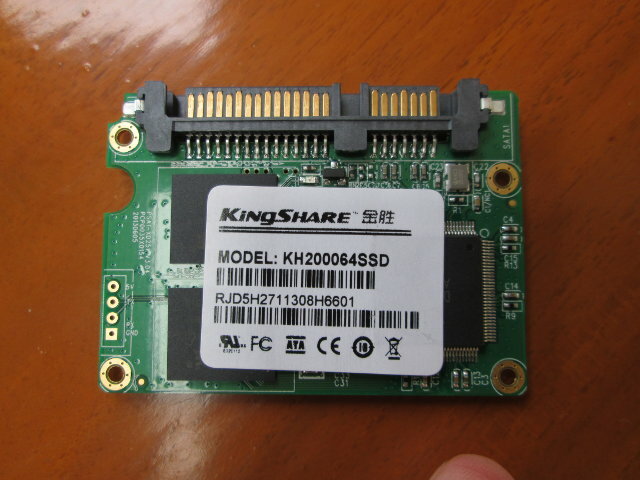 This side of the board also has a Kingshare SSD connected to a mini PCIe port half slim (MO-297) connector. I could take it out, and it’s definitely not an SD card ;), but KingShare KH200064SSD, a 1.8″ SATA II SSD with 64GB capacity, a read speed of 150MB/s, and a write speed of 80MB/s according to specs I found on eBay and jd.com. Unfortunetaly, the USB 2.0 to SATA bridge means performance will be likely limited to read and write speeds to around 30 MB/s, but it’s something I’ll check out in the review. I’d like to thanks GearBest again for providing Voyo V2 mini PC sample, and you may consider purchasing the device from their website for $120.99 including shipping. Please note that there are two versions: one with a 64GB SSD and a 5,000 mAh battery, as shown in this post, and a cheaper one with a 8,000 mAh battery, but not SSD. Voyo V2 can also be bought from other sites including GeekBuying, eBay, and Aliexpress. That’s not a PCIe SSD, it’s simply a half slim SATA SSD, similar to http://uk.transcend-info.com/Products/No-513 for example. Thanks. I did not know about that. You should had broken this device completely and just recycle it in the trash bin. Who is the fools to buy this? What a waste of a review. The least you could have done was actually review the box before destroying it to see what was inside of it. It would have been nice to know how it ran, if it ran hot, etc. Whoever sent this to you as a sample wasted their efforts. Who said it’s not working anymore? It will most certainly be running just fine, only the top of the case is broken, and the WiFi antenna is unsoldered. I can still test it via Ethernet, and maybe I’ll solder the WiFi antenna back. Well, it would be nice to get an actual review of the product. I was interested in it and have been waiting for a review of it’s performance and whether there were heat issues. Unless you can get the top on securely or unless it has performance and heat issues with it off I guess I will have to wait for someone else to review it who doesn’t rip it apart first. Yes, your tear down did provide some good information but it would have been better if your reviewed the functionality of it first before tearing it down. I look forward to a real review. I forgot to mention that… It’s only Fast Ethernet. As I am one of many that have tried one of these….. as regardless of those who wouldn’t buy one, there are some interesting uses for such a small form unit, BUT, also one of the many that would appear to have received it from GearBest in either a non working condition, or only short lived – as with mine as. Is it possible to get this apart without the damage? i.e. with the 2 screws out, can you action the plastic clips to get the case off? It would also have been nice to get battery info as mine came with a battery @ 40% that never took a charge, and ironically, once the battery was exhausted, it wouldn’t work on AC adaptor alone. 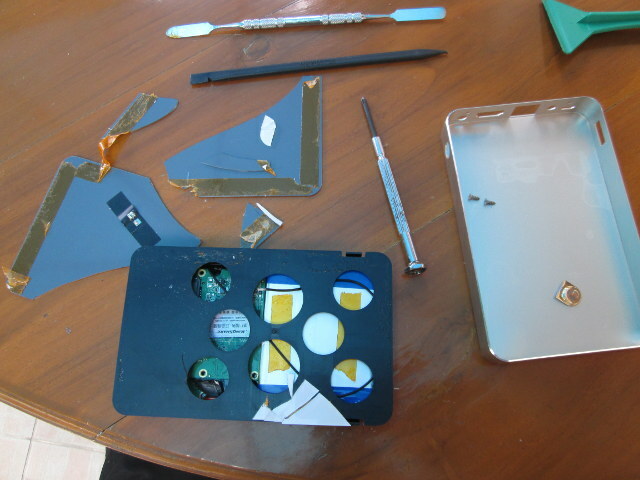 The glass cover is glued on top of the case, and you need to remove it before accessing the plastic clips. Thnx for opening your device 😉 So basically you are not able to upgrade the SSD without destroying the glassplate? Hopefully there is a way to do this as i want to use this device as a mobile arcade emulation station. Allready have the BT gampeads & keyboard/mouse and 64GB should be enough to host most games but more is beter (in this case hehehe). You can see sticky tape all around the glass plate. So if somehow you can slowly move the top cover it might be feasible. But I think it’s really a challenge, even after knowing what’s under that glassplate. yeah…. i’m afraid that i will destroy the wifi antenna cable so maybe i will “stick” to the 64GB. BTW those half slim SSDs are expensive !!! The battery is 8.74Wh, at the rated 3.8V that makes for 2400mA/h. So, rated at normal power consumption that should be good for about 30 minutes at idle. Does the thing support suspend to ram ? I’ve bought one with the 64GB SSD from GearBest as well, and also opened it to see what’s inside. First, never ever open any lid with a screwdriver. Use a plastic knife (the one that comes with Play-Doh are great), guitar plectrum or a schroud to open notebooks. You can replace the antenna with an old internal antenne from a wifi router or old notebook. Works like charm. The unit is no more than a Windows Tablet. It performs just like that. you can purchase a heat gun and use it to soften the glue. I received mine non working, (found about 10 on YouTube with same problem) so I would like to open it up to check the battery connections. Can you describe in a bit more detail how you opened it up without breaking the glass? Is it a 64bit system ? And possible to replace/install linux instead of Windows ? I received one not working too and obviously broke the glass but I didn’t unsoldered the Wifi Antena. The best advice to do it, do not use screw driver nor credit card or alike. Prefer smaller things like plistified visit card, the Quality card provided in the box. but it’s probably really hard not to break it. Start from one corner, use a SUCTION PAD (Ventouse in French) to lift the glass up. 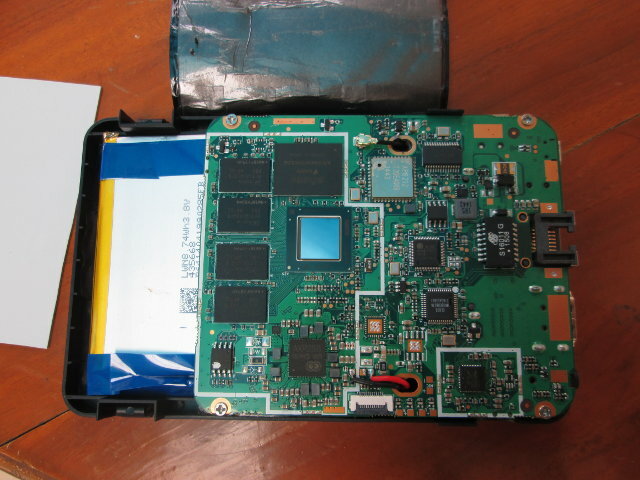 You need to get access to the part that is at the oposit of the connectics, this is where 2 plastic trap (one on usb side and one on switch on button side to remove it from the box. After you’ll have to remove the plastic covering the battery wires. Do it slowly and it should be good for your glass! PS : The computer is heating quite a lot (at least while playing), heating gently while reading a film. Sorry I don’t have any Temperature probe. Would it be possiable to take out the SSD, install a booteable Ubuntu on it, and then use the machine as a Ubuntu machine? I don’t think you’d need to take out the SSD. Simply install the OS to it via a USB stick. But based on the benchmark results @ http://www.cnx-software.com/2015/10/03/review-of-voyo-v2-intel-atom-z3735f-mini-pc-with-battery-and-ssd/, you’d better use the internal eMMC, as it’s faster than the SSD for sequential I/Os and random read, and about the same for random writes. Does anyone know, how to reset the voyo v2 mini pc to default uefi bios settings? From one day to another there is no signal on the monitor. Lamp burns green at startup but no messages. I connected a wired usb keyboard and pressed any kind of combinations during powerup (Esc, Del, F1 to F12) but no result. The device goes on or off correctly (usb-cdrom on usb-hub started) but no screen. I just entered the uefi bios before and set a supervisor password. After that the voyo started correctly into windows 10. Then next reboot was the last one, screen remains black. My battery has started swell up, disassembling the casing in the process.. Does anyone know whether the device works with battery removed? If I remember correctly other people (see comments above) could not boot their Voyo V2 because the battery was not connected. So you may want to leave it that way, or replace it with a similar battery. I removed the battery which, as mentioned above, left the PC dead. So, I tried to connect the power adapter directly where the battery had had been. And it worked perfectly. I saw the comments above, but hoped someone had more info. Leaving it as it was did not feal like an option. @Viktor thank you for the pointer! Fixed my Voyo. @Viktor Thank you for sharing your experience, going to connect as you did.